386 West 2nd Street- Two Stones: father William Stone: 1866 log cabin; son James Stone: 1875 adobe house. 386 W. 2nd St 1911: The 1866 log cabin on left belonged to William Stone and the 1875 adobe house belonged to his son, James Stone. Pictured above is James Stone’s wife, Mary Melling, with her pet owl and her granddaughter, Exta Stone. 386 W. 2nd St. 1930: Rear lean-to and upper level visible; photo c. 1930. 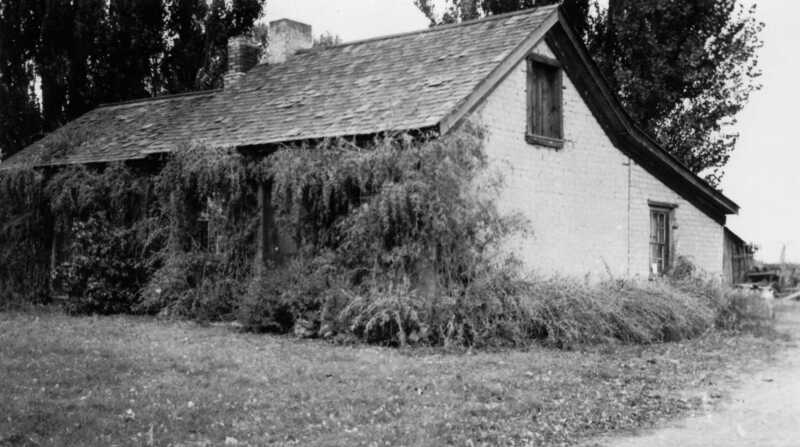 386 W 2nd St 1955: The house was covered with stucco and painted white; the door on the cabin was closed in and a porch was created on the adobe section; two roof levels still visible; photo Weber County Assessor. 386 W. 2nd St. 2010: covered with siding; one roof level. This is a two-part house: William Stone came from England in 1853 and built this one-room log cabin for his wife and two unmarried teen aged sons in 1866 on the NW corner of 2nd Street (Bingham’s Lane) and 1200 West (Perry’s Lane). The cabin was fifteen feet square. Log cabins were the popular type of homes on 2nd Street and in the Utah Territory during the first twenty plus years of settlement from 1847 to 1870. Sometimes log cabins were considered impermanent “starter homes”, but fortunately, this one is a permanent preserved treasure. The logs came from Monte Cristo. William’s son James bought the one and a half story adobe house at 386 West 2nd Street in 1877 (it was built by George Gates a few years prior). An adobe single-cell house was the first step up from a log cabin, and an adobe mill had opened on 2nd Street in about 1870 making “dobies” from the mud in the “Second Street Swamps”. The front of the adobe house is symmetrically designed with one door between two windows; the single room on the ground level is 15 by 13 feet interior; the exterior walls are presently one-and-a –half feet wide. 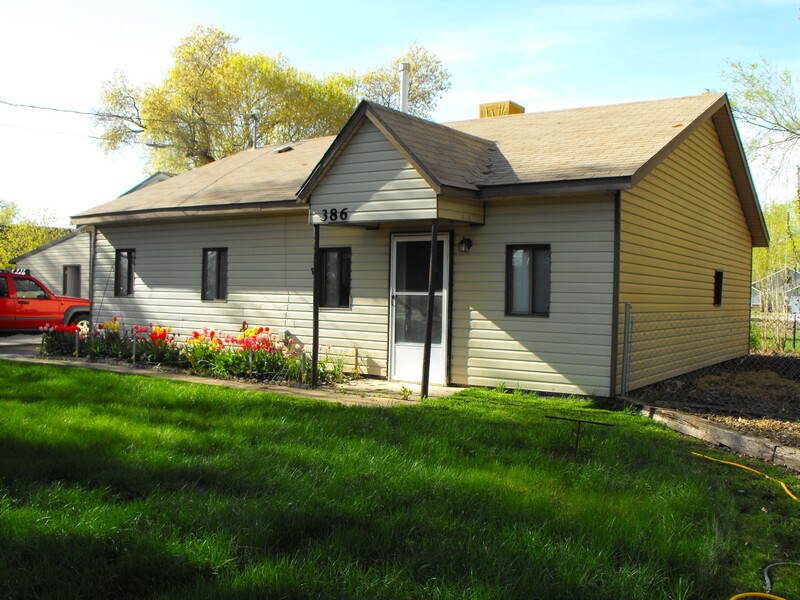 This single-cell (one room) house type is an English form found in all sections of the United States. The upper half story was just for sleeping and was accessed by a stairway on the interior west wall or outside through the east window with a ladder. There was also a cellar accessed through a trap door in the floor. This small house type was a substantial and fashionable residential form that remained popular in Utah well into the 1890s. William died in 1868. In about 1879 James “teamed up” the log cabin, pulling it on skids about one mile east to his adobe home. He abutted the log cabin to the adobe house and built a brick lean-to on the rear, making the house four rooms on the ground level. There was also a loft for sleeping in the cabin. 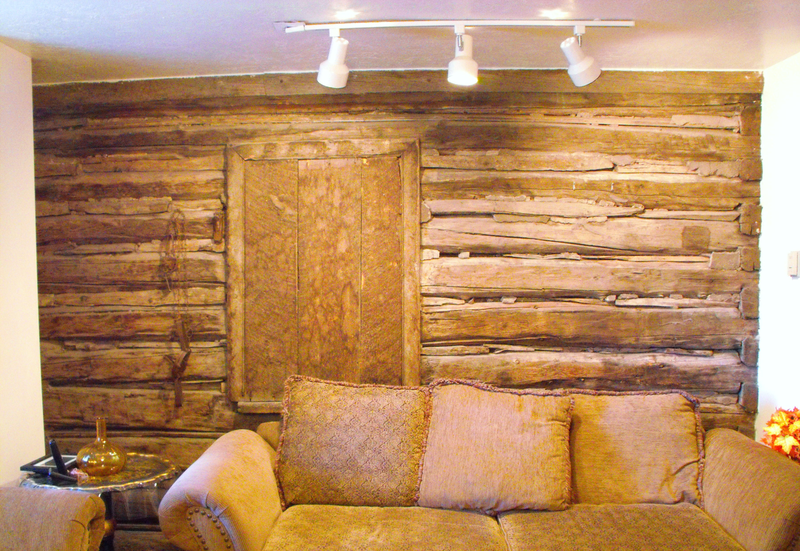 Today a wall of the 1866 cabin is visible in living room of 386 W. 2nd St.; lumber for the cabin came from Monte Cristo. In about 1950 Elmer Brown remodeled the house; he closed in the front cabin door, put shutters on the windows and covered the outer walls of the cabin and adobe house with white stucco. The roof line stilled showed the separation of the cabin and the adobe house. 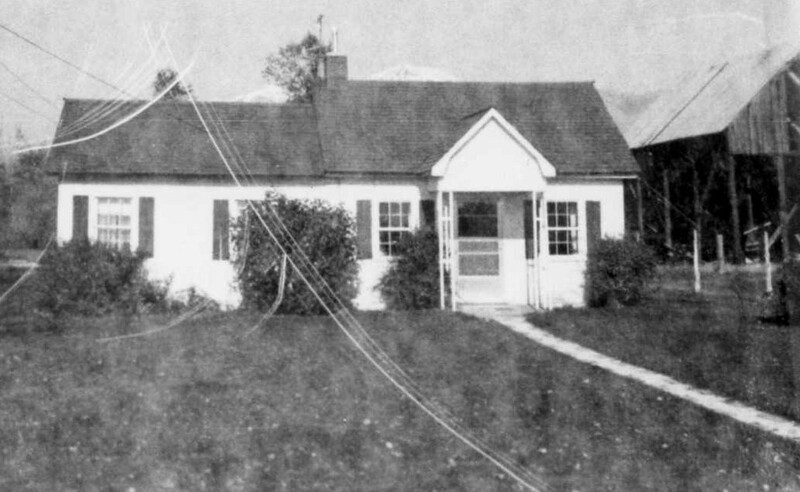 See c. 1955 photo of the house above. 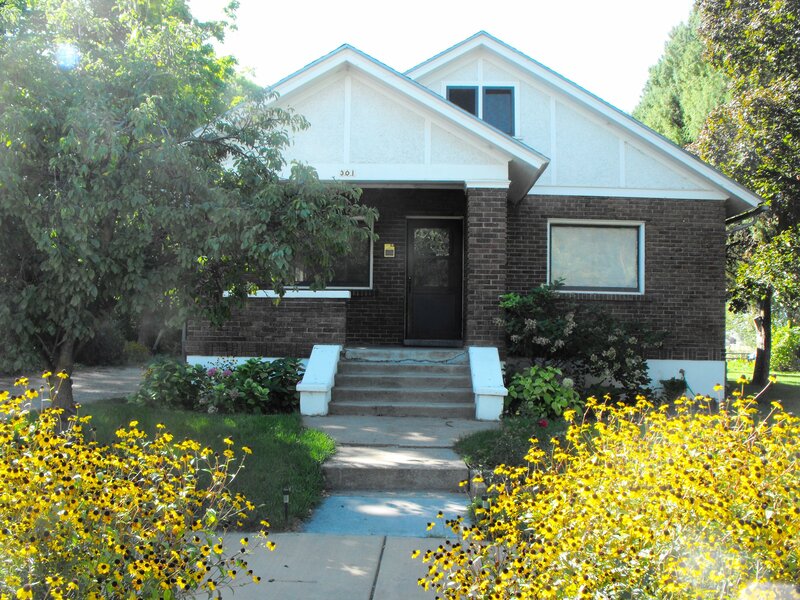 In the 1990s the stucco house was covered with siding and a new roof with a continuous line was installed. See 2010 photo of the house above. 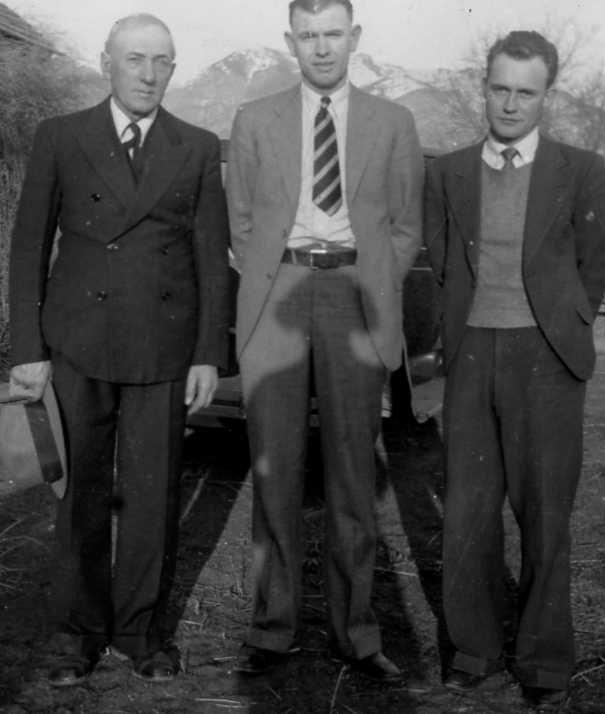 L to R: John Melling Stone, son of James and Mary Melling Stone, with his sons-in-law, Clyde Montgomery and Elmer Brown standing in front of house at 386 W.2nd Street; photo circa 1940. 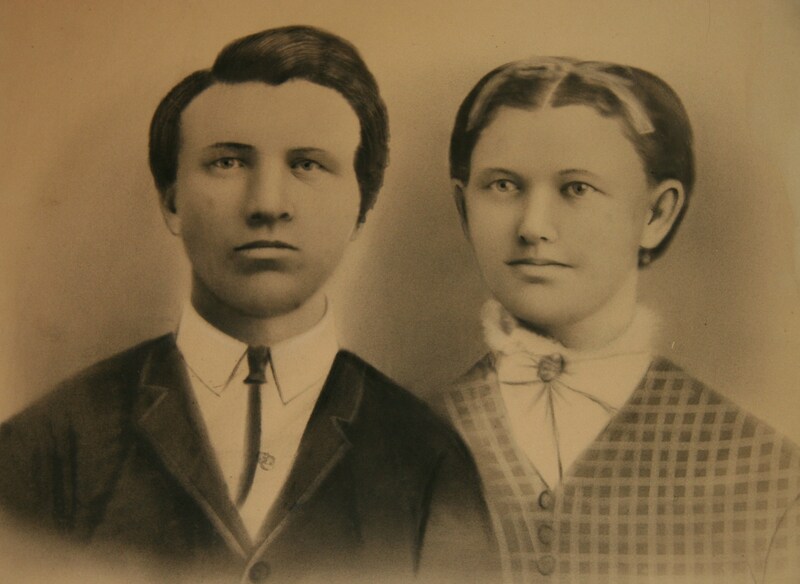 William (1798-1868) and Mary Cruse (1811-1886), converted to the gospel teachings of Mormon missionaries in Berkshire England. William was 56 and his wife was 44 when they arrived in Bingham’s Fort in November1854. They had seven children with them. In England they had lived in a comfortable home with servants, and now the family built and lived in a log house on the American Utah frontier. William was a talented farmer, having worked as a landscape gardener for nobility in England. He taught his sons the art of husbandry; he and his sons were known for the beauty and order of their farms, orchards and flower gardens. Mary liked to say that William could raise mushrooms the size of tea saucers. Mary Cruse learned the art of millinery in England, and in the Bingham’s Fort District she took straw from the fields, split it and braided or wove it into hats for both men and women. 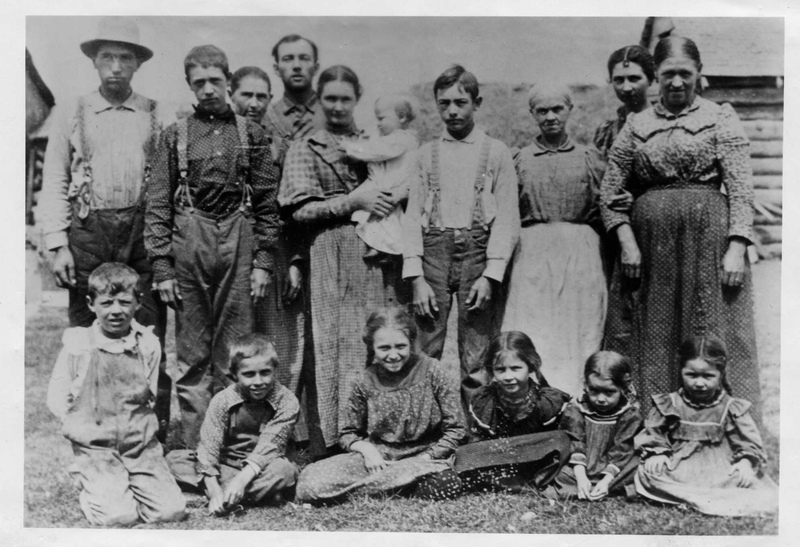 Even though living in the survival mode of the pioneers, she took pride in dressing her children as neatly as possible. They built their first log house in about 1856 on the lane north of the Bingham school house. This cabin had a cellar, and in 2002 the cellar was excavated and enlarged into the water retention area on Lynne School Lane. The Aspen Acres subdivision was the William Stone Farm in 1855-1866. 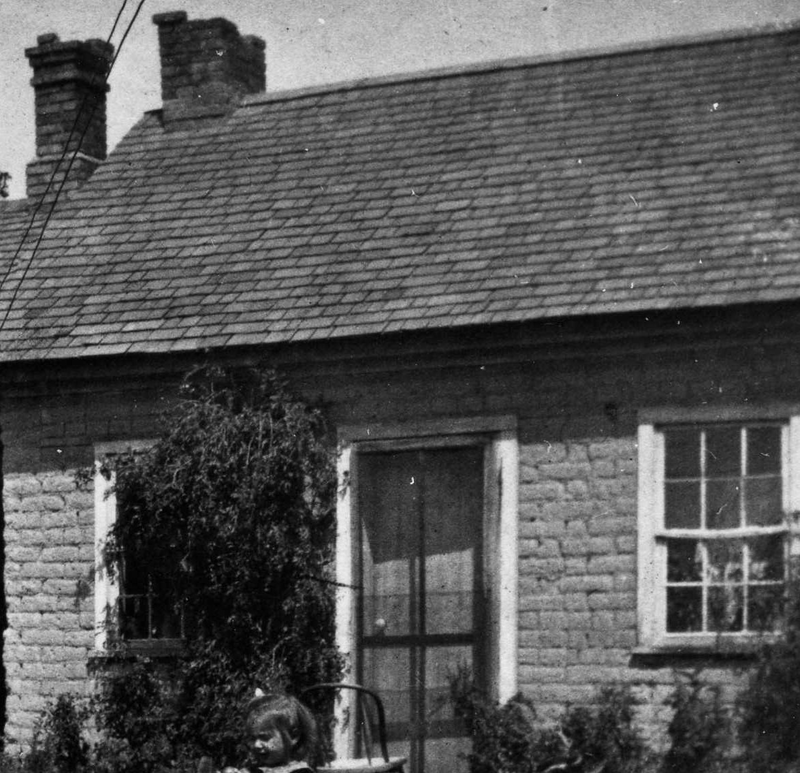 Giving that cabin and farm to their oldest son, Edward, in 1866, they moved to the NW corner of Bingham’s Lane and Perry’s Lane (today’s NW corner of 2nd Street and 1200 West) and built the cabin pictured below. William died in 1868. 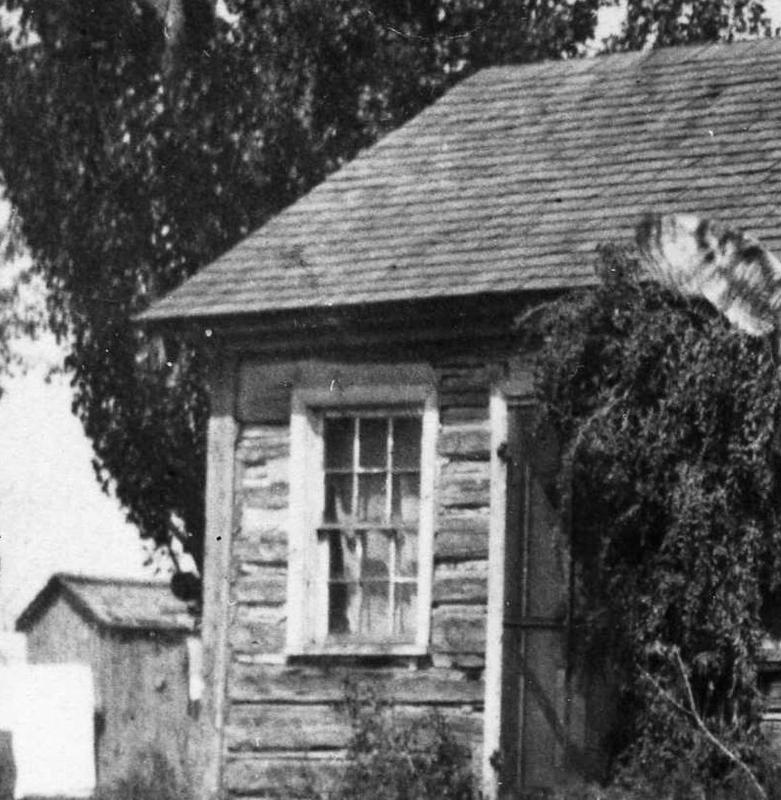 In 1866 William Stone built this cabin on NW corner of 2nd St. and 1200 West, and his son “teamed-up” the cabin to this location in about 1879 and joined it to the adobe house. James Stone was the youngest child of William and Mary Stone born in 1853 in Council Bluffs, Iowa; he was one and a half years old when they arrived in Bingham’s Fort. He missed the education and affluence that his five older siblings experienced in England. James was raised in two different log cabins built by his father and older brothers, built his own cabin at age 19 by Stone’s Pond and then purchased this modern single cell adobe house in 1877 at age 24. As a young man James was high spirited, an able fighter and fond of horses when he eloped with Mary Melling on May Day in 1871. He was 18 and she was almost 16. Their marriage proved to be a very happy one. However to their dismay, James was excommunicated from the Mormon Church for eloping against the wishes of Mary’s parents. 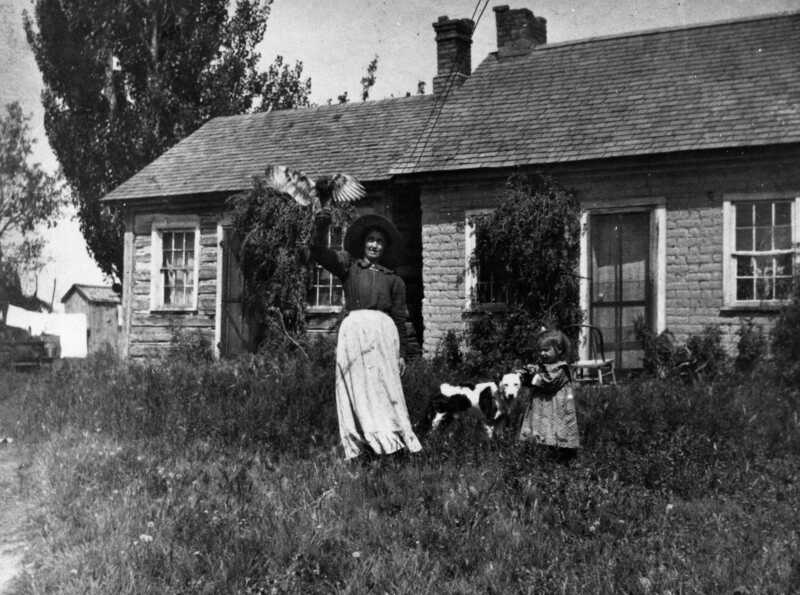 For the first year of their marriage they lived with James’ widowed mother in the cabin pictured above when it was located on 2nd and 1200 West. Within a year James bought some farmland from Sam Gates on the north side of 2nd Street and built a cabin by a pond. This west portion of the Gates Farm was cut by the new railroad track bringing unwanted tramps into the area; perhaps this is why Sam Gates sold this section to James Stone. However it proved to be a wonderful place to live, and in time the pond came to be known as Stone’s Pond. 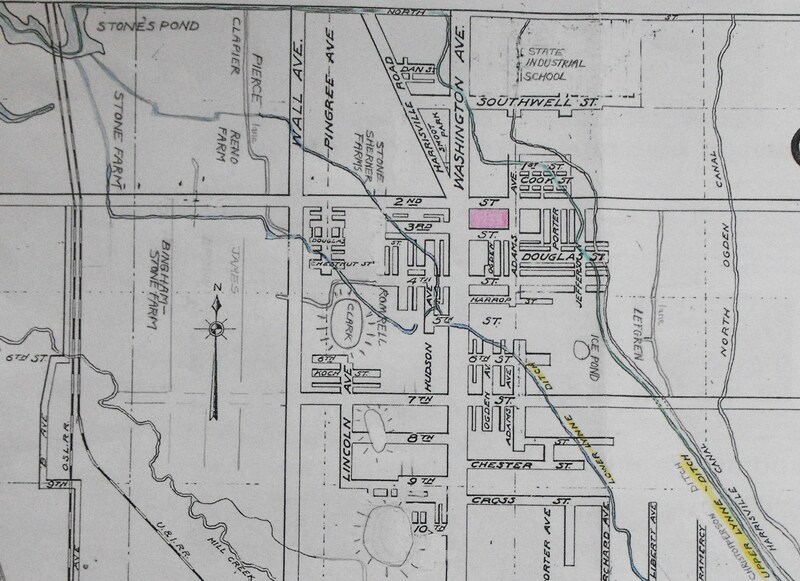 1919 map showing Stone’s Pond in upper left corner. Built by George Gates c. 1876 at today’s address of 386 W. 2nd Street. James and Mary left their cabin by the pond and moved in the new adobe house in 1877. Two years later they “teamed up” the cabin of James’ widowed mother from 2nd and 1200 West and attached it to their adobe house at today’s address of 386 West 2nd. To “team up” the cabin means it was placed on a wooden skid and pulled by a team of horses. The 1866 log cabin and c.1875 adobe house were joined together in about 1879 to make a combined home for James Stone family and his mother. James added two lean-to rooms on the rear. With hard work over many years James acquired a lot of land, drove fine horses and owned nice carriages such as a “white-top rig” that was very comfortable for the family to ride in. He also had a small carriage with a leather top. [7a] In 1884, having a premonition of his death, James made sure the abstract and title to their home and land was legally in place for his wife’s benefit. He bought her a new stove and sewing machine saying that it might be the last one that he would ever buy for her. In November 1884 James was injured in a run away horse and wagon accident; he died on December 24, 1884 and was buried on Christmas Day. Mary Melling Stone retained the farm with the aid of the Stone brothers, Ed and Moroni, and her children. At times it was necessary for her to go into the fields and hold the plow and do other work only suited for a man. She prayed continuously to God to bless her crops. She recorded that no one knew how hard it was for her, but that God did bless her and open up her way. Her tithing record for 1885 is still recorded on the wall of the Bishop’s tithing house located at 196 2nd Street. She raised her children and also took in three other motherless children who needed a home, permanently adopting one. The family became active members of the Lynne Ward. Mary Melling Stone Family in 1900; Mary is standing third from the left; her mother Ellen is standing third from the right; photo by Arthur Parsons. Mary’s mother, Ellen Knowles Melling Salisbury, was also a widow and moved in with Mary in 1885. 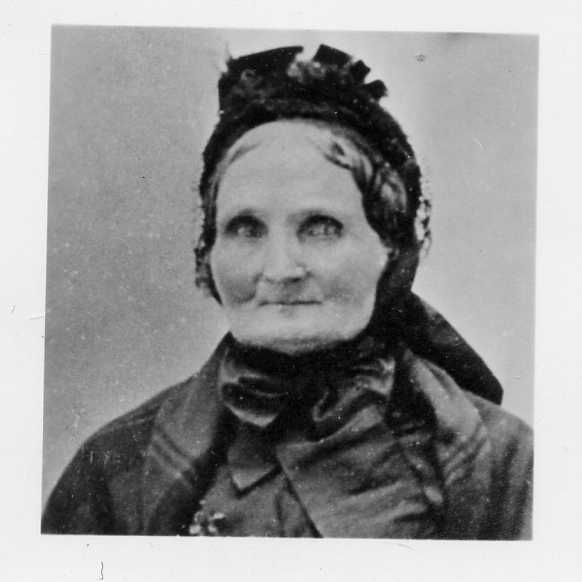 Mary Cruse Stone died in 1886. Ellen Salisbury was musical and many years earlier, when living in England, she read and loved the poem, “Oh Say What Is Truth” that was published in the Millenial Star and written by English poet John Jaques. At that time she composed music to the words of the poem. Now, about forty years later, this poem with her music was about to be published. John Jaques came to Mary’s house many times in the 1880s so that he and Ellen could polish together her music and his poem to their satisfaction. They played the song over and over on a pump organ in the adobe parlor before its publication in the Latter-day Saints Psalmody in 1889. Mary and her mother Ellen were members of the first Relief Society in the area that included the settlements of Lynne, Slaterville and Marriott. 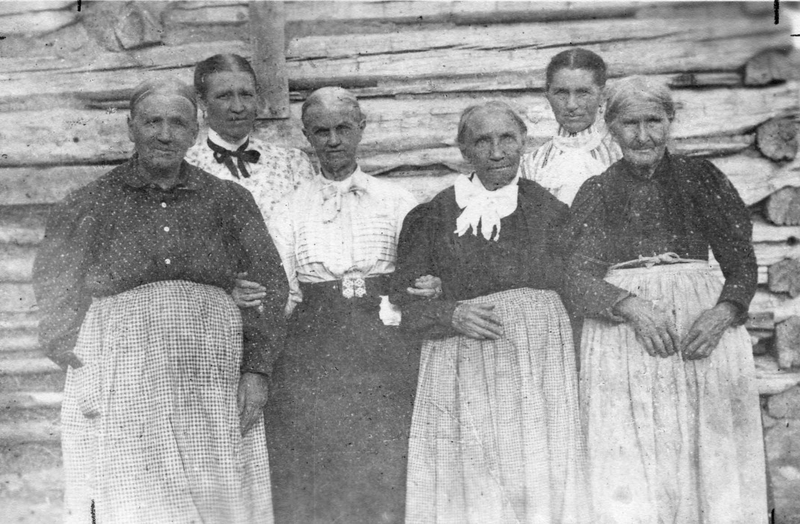 Back row: Mary Ellen Salisbury Parsons, Mary Melling Stone. Front row: Elizabeth Marriott, Ellen Knowles Melling Salisbury, Anne Bickington, Harriet Reeder. Arthur Parsons photographed these surviving original members of the 1868 female Relief Society of Lynne WARD in 1900. In 1889 at age 34 Mary Melling Stone was married in polygamy to Walter Crane. Mary remained in her own home and continued to run Stone farm. A number of men on 2nd Street who practiced plural marriage were jailed in the 1880s and the early 1890s for what was termed in the newspaper as “UC” (unlawful cohabitation). Jail terms were usually six months and were accompanied by a fine from $100 to $300. Among those jailed were Bishop Daniel Thomas and Levi Taylor who married one of Sam Gates daughters. Walter Crane went into hiding “on the underground” in Tooele but when that proved unsatisfactory he went on a church mission. 105 W. 2nd St., built by Carl Stone in 1928; photo 2018. 301W 2nd St., built by Chauncey Stone in 1925; photo 2014. Interview Chauncey Stone by Macel Montgomery, March 27, 1977, p. 2; Thomas Carter and Peter Goss, Utah’s Historic Architecture, 1847-1940, 1998, Utah State Historical Society, p.11; Milton R. Hunter, editor, Beneath Ben Lomond’s Peaks, 1944, Daughters of Utah Pioneers, p. 362; notes of Alice Grace Stone, daughter of Moroni Stone, notes in possession of Emma Rogers. Interview Chauncey Stone, 1977, p. 2. Sarah Stone Crowther, Mary Cruse Stone, manuscript, p. 1, 7; 1860 U.S. Federal Census. Sarah Stone Crowther, Biography of James Hyrum Stone, manuscript, p. 4. Milton R. Hunter, editor, Beneath Ben Lomond’s Peaks, 1944, Daughters of Utah Pioneers, p. 362. Dorothy Amelda Sherner and Laura Beatrice Sherner Welker, Mary Elizabeth- Her Stories, 1933, manuscript, p. 36; Crowther, Mary Cruse Stone, p.6. Milton R. Hunter, editor, Beneath Ben Lomond’s Peak’s, p.262,263. [7a] Sarah E. Crowther, Biography of Mary Ellen Melling Stone, handwritten manuscript, c. 1935, p. 82,83. Autobiography of Mary Ellen Melling Stone Crane, 1922, manuscript, p. 10; Autobiography of Mary Ellen Melling Stone, 1915, manuscript, p.3. Autobiography of Mary Ellen Melling Stone Crane, p.1; oral interview Chauncey Stone to Anna Stone Keogh. Richard C. Roberts and Richard W. Sadler, A History of Weber County, 1997, Utah State Historical Society, p. 175, 176. Photo identification, standing: Chauncey Stone, Charl Parsons, Mary M. Stone peeking over shoulder, John Stone, his wife Jesse Mills Stone holding baby Wilford, Peter Stone, Ellen K. Melling Salisbury, Sarah Stone Brown, Mary Salisbury Parsons. Sitting: Carl Stone, George Parsons, Anne Parsons, Darhl Brown, Violet Brown, Ruby Parsons; photograph c. 1900 by Arthur Parsons.